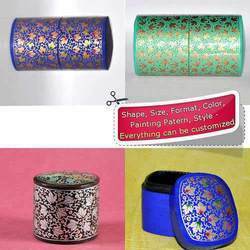 Exporter of a wide range of products which include hand painted wooden carved elephants - various sizes, powder box - hand painted paper mache box - eco-friendly, assorted paper mache hand painted trinket jewelry box and hand painted blue floral decorated elephants made of wood. 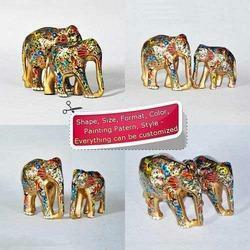 We introduce ourselves as a leading manufacturer, trader and supplier of Hand Painted Decorated Elephants Made of Wood. These decorated elephants are designed as per the set market norms by our experts using high quality material and ultramodern techniques. We offer our decorated elephants in varied designs & finishes as per the need of customers. Our decorated elephants are provided in quality packaging so as to maintain its defect free range at customer’s end. 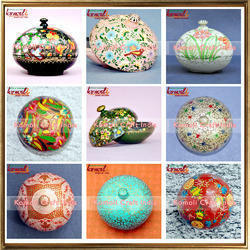 Beautiful Indian Handmade Hand Painted Paper Mache Powder Box, Handpainted with Perfection. This can be customized as per your painting pattern requirement and color combination. Available in more than 100 combinations of motifs and colors. Packaging Details: 1 - Individual Piece in Poly Cover or Box as required. 2 - 50 Pieces in Master Bag | Box as required. 3 - Master Carton of 7 Ply at least. 4 - All Weather Shrink Wrapping of Master Carton. 5 - We can pack them as per your specifications & requirements as well. 6 - Bar-coding and Branding options are also available with small cost. 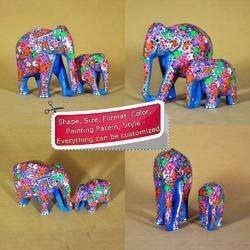 This Paper Mache hand painted decorative elephants will make a delightful gift. Each elephant is carefully hand painted. Looking for Hand Painted ?